You know that the more content you have on your blog, the more opportunities you have to attract visitors and turn them into leads. But you’re probably wondering if you even have enough time to dedicate to the blogging thing—and how much time you should actually spend writing a blog post! We get that—they’re good questions. You need to know whether or not it’ll be worth it, after all, or if you need to consider other options. To help you out, we pulled data from an 18-month time period to find out how long it takes us to write a blog post—and how those hours are broken down. Every company is different, so your average time per blog may be different. But following this article, you should be able to create a reasonable estimate of how much time it might take you to accomplish the same task. We analyzed the data and found that during this 18-month time frame…. It took us an average of 4 hours and 24 minutes to complete a blog post, start to finish. 23 minutes (9%) was spent on content interviews. 2 hours and 55 minutes (66%) was spent on blog writing and research. 1 hour and 6 minutes (25%) was spent on editing. Note: This time average doesn’t include any of the planning that goes in before the article creation phase, including persona development and keyword research, or posting the blogs in HubSpot or Wordpress. We often tell our clients our lack of insight into their industry is a good thing—and we mean it. Why? Because the ‘beginner’ questions we’re asking are likely the same (or similar) to the ones their ideal customers are asking when they first start looking for a solution to their problem. It may be tempting to write every blog article based on your own industry knowledge, but we recommend discussing as many article topics as possible with colleagues in and outside of your organization. This process will help you gain insights and perspectives you may not have considered otherwise. If you choose to do this, you may find these do’s & don’ts of subject matter expert interviews to be helpful. Pre-research the topic and create questions to ask the SME. Conduct the interview (in person or through online meeting software). We spend almost exactly two-thirds of our time actually writing a blog post, and we imagine this is where you’ll spend the bulk of your time as well. There is one thing that sets an inbound marketing blog post apart from every other blog post: Purpose. The goal of an inbound blog is to help the person reading answer a question they have or understand a problem they’re facing. Whether you’re planning to write these blogs yourself, have someone in your company write them, or hire someone outside the organization to write them, this person needs to have a firm grasp on the purpose of the blog. Anything less is a waste of time and money. Transcribe the recorded interview (if applicable). Draft the outline of the article. Write and rewrite...and rewrite...and rewrite. If you think the editing process is solely about grammar, think again. The adage, “Write without fear, edit without mercy” couldn’t be more spot-on. Having an error-free article is critical, but a great editor can sharpen a decent blog into an effective blog by digging into the content. Our editor Meredith doesn’t just make simple changes to the articles she reviews, she asks questions, calls out discrepancies, and makes us better writers. The screenshot below shows Meredith’s markup on the first few paragraphs of this article. You definitely want a Meredith on your team! Assess the article’s readability and suggest changes. Make line edits to correct sentence structure and grammar mistakes. Correct any issues with client-specific tone. Review client revisions and make requested changes. Check the article for search engine optimization (SEO). Do you have an extra 422 hours a year? If you want to post eight blogs a month (which is ideal for solid inbound marketing results), you’ll spend just over 35 hours a month on blogging—which is over 422 hours in a year. Give up. Yes, really. 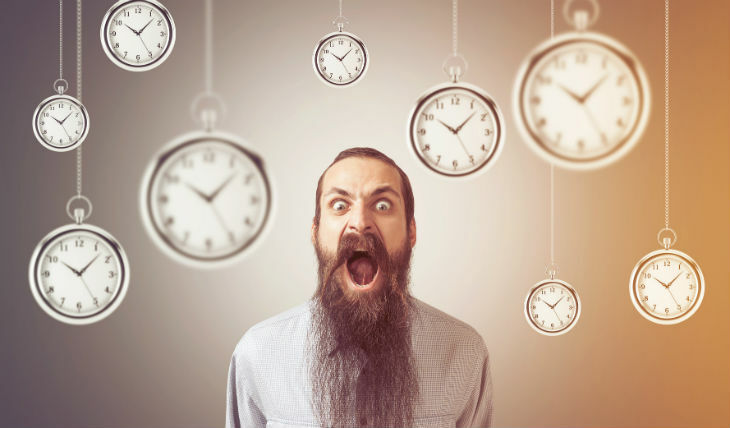 If you can't devote the time and don't have the skill, don't bother blogging. You'll put up a few posts you aren't happy with, and then you'll watch your blog collect dust. If you can't devote time to this, do something else you have the time and skill to do. Ask current employees to create your blogs. If you already have a marketing team or have some employees with a natural talent for writing, you may choose this route. It cuts out the hiring process, but it can really cut into these individuals’ day-to-day tasks and put a heavy burden on their workload if you’re not careful. Hire an in-house writer and editor. If you want to keep your marketing in-house and your current team doesn’t have the time to take on blogging, consider hiring a full-time writer and editor. Hire a freelancer writer and editor. Another option is to hire freelance writers and editors for your content creation. Sites like Zerys, Scripted, and TextMaster are all good places to start your search. Be sure to test the skills of any freelance writer before you employ them to be certain they can write in the way you need (that is, focused on solving readers’ problems in a compelling, interesting way). Hire an inbound agency. If you already have a solid marketing process in place (including driving visitors to your site, turning them into leads, and seeing higher sales results), one of the three options above will probably work for you! But if you aren’t seeing the marketing results you’re looking for, hiring a blogger may be just a band-aid. A better solution is to rework your marketing strategy as a whole—and hire an agency to do that. Agencies can cover every area of your marketing needs—from persona development to keyword research to blog/offer creation and more. This blog walks through possible costs, benefits, and drawbacks of the options above. If this all seems a little overwhelming, don’t be discouraged! Remember, these results are specific to us at Nectafy. You can whip up posts a lot faster than this (or considerably slower)—but if you want results, we believe quality is what matters. Once you get started, let us know: How long does it take you to write a blog post? Comment below or tweet us @nectafy! 1 - 5 clients + Nectafy. 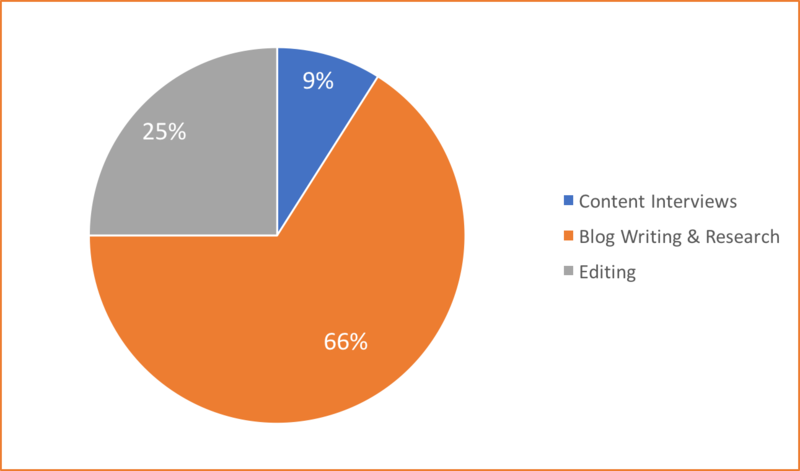 2 - 10 individuals contribute to the Nectafy blog, but only four write for client blogs. 3 - Includes content interviews, blog writing and research, and editing.